Although I'm not a sailor myself, I can still appreciate the peacefulness of a quiet sail and the beauty of nature. 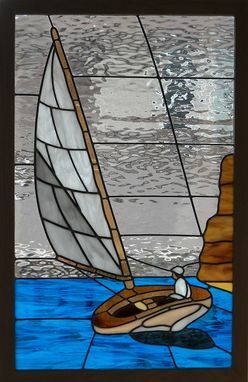 Here is an old salt with his old Sailboat in stained glass. I think the various shades of amber work well for the wood, don't you? 20 x 31 inches. For an additional cost of $75, rectangle items can be framed in oak with a walnut finish and ready to hang with (2) 12 inch chains.